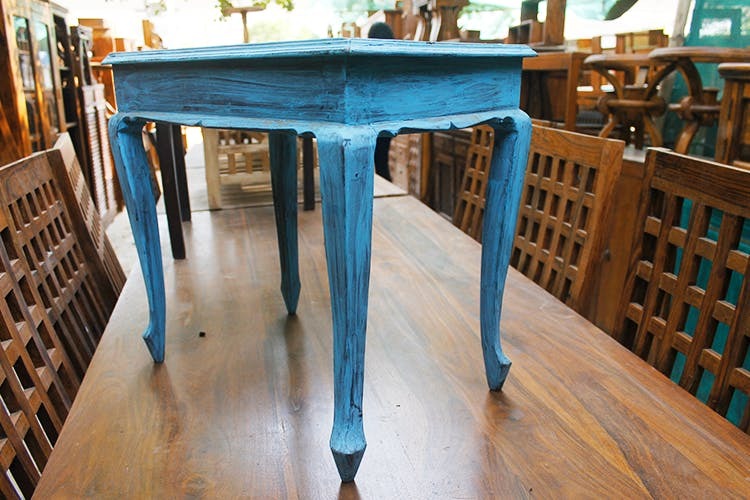 We set about looking for Sikanderpur furniture market, one afternoon, and came by a stretch of shops that have an eclectic selection of wooden pieces, cane furniture and knick-knacks. Since the shops don’t use too much reclaimed wood, prices are a bit higher but you can still score a terrific bargain on stools, tables, a chest of drawers or mirrors. PS: For first-timers, this market might be a bit hard to locate but DLF City Court is a good landmark. If you ask around, you’ll be pointed in the right direction. Old-timey, if that’s the vibe you’re going for. With enough space for a cup of coffee and your favourite book. That double up as mirrors. Hey there, good lookin’. Straight out of the cafe of your dreams. So you can hang in there. In gold, silver or whatever other colour you’d like.